Hoodman RAW 32GB CF cards with 64GB flash cards hopefully coming; 8 GB Compact Flash card from Hoodman great for Nikon, Canon, as well as medium format Phase One cameras. 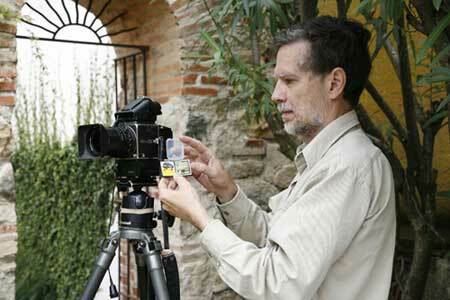 Now using the Hoodman 16 GB flash card in Hasselblad PhaseOne and Canon EOS-1Ds Mark III. Hoodman RAW 16GB CF memory cards, 32GB, eventually 64GB: Compare price or compare quality and reliability? Here are two different Hoodman 16GB RAW CF memory cards at use in Guatemala. Dr Nicholas Hellmuth holds a Hasselblad with PhaseOne P25+ (that definitely needs a 16GB and would be better with a new 32GB compact flash memory card). Sofia Monzon holds another memory card. Between them is the 21 megapixel Canon EOS 1Ds Mark III that also is a memory hog (a polite way of saying that this level of camera needs 16GB or better, 32GB CF memory). Nicholas and Sofia are photographing a snail nestled among the thorns on the sacred Ceiba tree, the World Tree of Mayan culture. I don't trust a Compact Flash digital camera memory card at low bid prices. Can you afford to lose your photographs because a cheap counterfeit card trashes your digital images? No one can guarantee that a glitch won't ruin your photos on your card, any brand. But still, if I start with a known name brand, of a company that is headquartered in the US (as opposed to far away China or Taiwan), then I feel more secure. For the past year FLAAR uses primarily Hoodman branded Compact Flash cards. Yes, we have used SanDisk and Lexar CF cards in the past; had no issues with most of them, but FLAAR prefers to work directly with a company where we can provide feedback. In other words, I prefer not to risk using lowest price cheap compact-flash memory cards, especially not 4GB, 8GB, 16GB or 32 CF cards. Besides, if you shop using the price comparison websites, you may end up with a counterfeit CF card. Counterfeit and after-market camera batteries have turned out to be junk, and even though I am cheap (FLAAR is non-profit), still, it is not worth it to risk buying counterfeit cards on the Internet. You can interact directly with Hoodman or see them at leading digital photography events. Hoodman exhibits at all the major photography tradeshows so we find it easier to stick with Hoodman RAW CF memory cards. Hoodman RAW 32GB and future 64GB compact-flash memory cards? 32GB is here already and yes, of course storage capacity of 64 GB compact-flash memory cards is already becoming available , but the 2 GB and 4 GB are acceptable for a 6 megapixel to 12 megapixel 35mm digital camera. For medium format digital backs such as Leaf, Phase One, Hasselblad-Imacon, Jenoptik, Sinar, and MegaVision, we use 8 GB compact flash memory cards from Hoodman. Now that the 16 GB cards are available, we have these also. The Hoodman �RAW� cards are fast. Very very fast. Just be sure you have a card reader that can facilitate these new faster speeds. An old card reader will work, just not as fast as the new speedy readers. Be sure to download the new FLAAR Reports photo essay on the diverse Hoodman RAW UDMA CF memory cards that the entire team of five photographers at the FLAAR institute use. These cards hold up to constant use even in hot tropical conditions with extreme humidity (we do most of our test evaluations in Guatemala, Central America; see www.maya-archaeology.org Most of the recent photographs of Mayan archaeology on that site were taken with Hoodman 16GB RAW CF cards. We do not yet have the 32GB cards, but look forward to evaluating them in the new Gigapan Epic Pro that we recently acquired. Nicholas Hellmuth using the Hoodman compact-flash memory cards: 8 GB for the Phase One, 4 GB for Canon EOS 5D, and 2 GB for his Nikon D200. Most recently updated September 8, 1010. First posted September 13, 2007.